As previously announced, the first such screening will take place on Saturday, November 23, simultaneous with the episode's broadcast on television networks worldwide. We're still not sure exactly when that will be, but some early rumors point to an airtime of 7:45pm GMT, which would correspond with 2:45pm on the East Coast of North America and 11:45am on the West Coast. The BBC has now revealed that these simulcast theatrical screenings will only take place in a limited number of cities, including Atlanta, Chicago, Dallas, Houston, Los Angeles, Minneapolis, New York, Philadelphia, San Francisco, Seattle, and Washington DC in the US. In Canada, the simulcast screenings will be held at theaters in Calgary, Edmonton, Montreal, Ottawa, Toronto, Vancouver, Victoria, and Winnipeg. The AMC, Cinemark, and Regal movie theater chains will all be participating in the US screenings, and tickets will be available beginning on Friday at 9am Eastern time via their respective websites and at theater box offices. In Canada, online ticketing will be handled by Cineplex, also on Friday. What's more, North American Whovians who aren't able to make it to one of the aforementioned cities on the day of the broadcast will have another chance to see the "The Day of the Doctor" on the big screen the following Monday, November 25. Some 300 cinemas in the US will be participating in this rerun screening, along with 60 cinemas in Canada. Tickets for these shows will also go on sale on Friday, with online ticketing via Fathom Events in the US and Cineplex in Canada. Both the November 23 and November 25 screenings of the episode will be shown in RealD 3D, although some theaters may opt to project it in 2D as well. 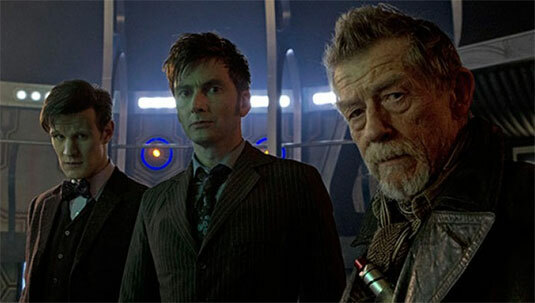 In addition, the theatrical presentations will include specially shot introductions to the episode, along with a ten-minute making-of feature called The Day of the Doctor: Behind the Lens, featuring actors Matt Smith, David Tennant, Jenna Coleman, Billie Piper, and John Hurt, plus executive producer Steven Moffat.